Breathtaking views, a panoramic pool and comfortable living – what more could you desire? Melitini, whose name derives from the Greek word meliteros (literally ‘sweet like honey’), offers guests far-reaching sea views, a panoramic pool and Jacuzzi, welcoming interiors and a sense of summery well-being that grows day by day. Inside: accommodation at Melitini is set over two floors. A flight of steps lead down from the parking area to the main entrance, which takes one into the fabulously welcoming and spacious open-plan living and dining area that flows into a well-equipped modern kitchen. The living area features high, beamed ceilings, comfy sofas surrounding a stone-clad fireplace and three sets of French windows which bring in stunning views of Skopelos Town and the sea harbour and provide access to a pair of balconies and a superbly panoramic terrace. Accommodation on the first floor is completed by a large, airy double bedroom with en-suite shower room and access to the panoramic terrace. Stairs lead from the living and dining area down to the lower floor, which is home to the master bedroom, complete with large en-suite shower room, a twin bedroom and a luxurious family bathroom with Jacuzzi tub and walk-in shower. Both of the bedrooms on the lower floor have sea views and French windows accessing the pool terrace. Outside: Melitini's outdoor areas have been conceived to maximise and showcase the property's stunning panoramic position overlooking the town and harbour of Skopelos and the sea. The main terrace, accessed from the lower floor rooms and by external stairs from the first floor, begins with a large expanse of stone-paved patio with al fresco dining area. A few steps at one end lead down to a shady living zone with superb views and, at the other, to an equally vista-strewn Jacuzzi. More steps from these areas take one down to the irresistible pool. Another particularly magnetic al fresco area is the terrace on the first floor, accessed both from the living area and a bedroom. Ideal for breakfasts, dinners, aperitifs or just dozing, the views from here are arguably the best of all. The definitive answer to this contentious subject, however, we leave up to you! Due to Melitini's location on the island of Skopelos and the limited number of hydrofoil/ferry connections between Skiathos and Skopelos (which might occasionally delayed or cancelled due to bad weather), we recommend that you book your flights to arrive either the day before your stay at the villa or in the morning of your arrival day. Similarly, for departure, we recommend you book either a late flight or a flight on the day after leaving the villa. A return taxi transfer from Skiathos airport to the port and a hydrofoil/ferry to the port on Skopelos are included on the first and last day of the booking. In the unlikely event that your flight arrives in Skiathos after the last ferry/hydrofoil to Skopelos has left, a taxi from Skiathos airport to the port is included but private sea taxis are not (however, we would be happy to organise one for you where possible). In this case, the return leg from the port on Skopelos to Skiathos airport for your flight home is of course still included. 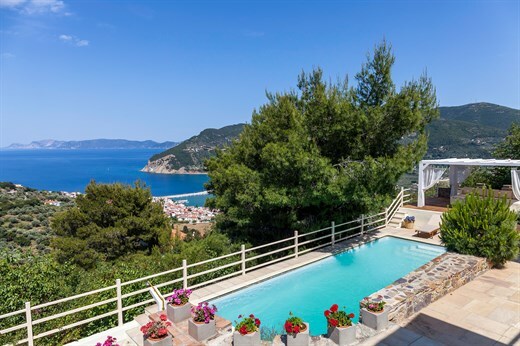 Melitini is situated in a panoramic position just above lovely Skopelos Town, whose harbour, tavernas and shops are just a few minutes' drive away. Skopelos island is the perfect size to explore in a week or two and offers various activities. A great variety of beaches are dotted all around the island's nearly 70km of coastline. Some, such as those in Skopelos Town, Panormos and Limnonari are easily accessible. Others can be reached only on foot or by sea, an excellent reason for hiring a boat for a day or two and exploring the island's gorgeous coves and bays. Skopelos is also a green and pleasant island, and the vibrant colours, heady fragrances and cooling shade of its pine and oak woods contend with the multi-blue-hued sea for visitors' attention. There are several good walking trails across the hilly interior, whose two main peaks, Mount Palouki and Mount Delphi rise to 546m and 681m respectively. You will come across numerous monasteries on your way, as well as some superb views and a few sleepy villages where time seems to have stood still. One such Glossa, whose silent whitewashed streets lead maze-like to a shady square offering yet more gorgeous views. Finally, just across the water, is Skopelos's sister Sporades Island, Alonissos, and its Marine Park. Both are highly recommended and easy to get to. For more information about hydrofoils and ferries to and between the Sporades Islands, please see our dedicated page. "Melitini is a beautiful villa in an exceptional location! The villa is also speced to a very high standard." Melitini is a beautiful villa in an exceptional location! The villa is also speced to a very high standard. Skopelos is like stepping back in time as we expected and hoped! The beaches were exceptional, the people so friendly, the views breathtaking and the food and wine too good!!!!! The Villa and the boat hire were the outstanding points! Going in May was a bonus as the island was so quiet which made the beaches unbelievably peaceful! The whole experience from beginning to end was honestly outstanding - I couldn't recommend you guys enough! We loved Melitini, the views, décor, artwork, kitchen, oven was especially good, bbq, jacuzzi, pool was great, fell in love with it. We loved the whole holiday at Melitini with a week not being long enough. Both the rep and the owner couldn't have been more helpful. Melitini is fabulous, superbly furnished and equipped, with breathtaking views. It is impossible not to relax when there. The island is very beautiful and the villa was a real feature of our stay. For a family with small children it worked well as it allowed us to spend days/evenings at the villa rather than feeling that we had to get out every day. Melitini is a beautiful property and location. We really enjoyed the peace and quiet of a villa on an olive covered hill overlooking the sea. Die Villa war genauso schön wie auf den Fotos auf Ihrer Website- und die Fotos sind brillant! Es war wirklich traumhaft da!!! Es war alles perfekt! Wir fühlten uns von Anfang bis Ende bestens betreut bzw. unsere Erwartungen wurden übertroffen. Wir werden The Thinking Traveller weiter empfehlen!